It wasn’t really a spat, but I couldn’t resist that headline! Jordan Spieth, currently ranked the best golfer in the world, has raised an interesting Rules question, which apparently is still under discussion by the Ruling Bodies. The official was not prepared to make an on-the-spot ruling and went away to confer with others officials, returning a few holes later. It would seem that the tournament officials were split and so they called the USGA, who also declined to give a definitive ruling, but, until they had discussed it further, they were ruling that he (Spieth) should not lick his fingers and then apply it to the sole of his putter, though he was permitted to use a wet towel to clean his club. During a stipulated round, the playing characteristics of a club must not be purposely changed by adjustment or by any other means. Q. A player spat on the face of his club and did not wipe the saliva off before playing his next stroke. Is this permissible? A. If the purpose of doing this was to influence the movement of the ball, the player was in breach of Rule 4-2b as saliva is "foreign material." 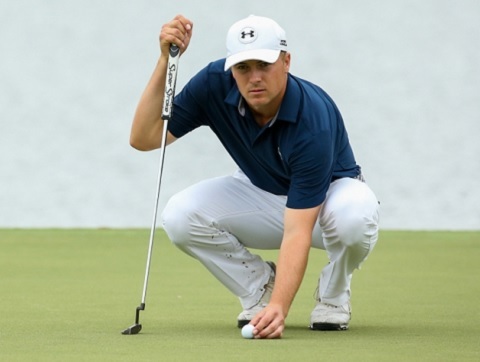 So, one can appreciate the difficulty faced by the Ruling Bodies; by applying saliva to the bottom of his putter Spieth was arguably not changing the putter’s playing characteristics in any way that could influence the movement of his ball, but his intention was to control the movement of his club to benefit his stroke in the playing of the hole. Presuming that this ruling will be ratified, the question remains as to whether using a dampened towel to ‘clean’ the sole of the putter, so as to achieve the same result, is allowable under the Rules, because it is using equipment in a traditionally accepted manner, as permitted by Exception 2 to Rule 14-3. In another incident at the WGC-Cadillac Championship, J.B. Holmes was penalised two strokes for playing from a wrong place. He had taken relief from a lateral water hazard (red stakes/lines) by dropping on the opposite side of the reference point where his ball had crossed the margin, equidistant from the hole. But instead of dropping within two club-lengths of that point, he went back nearly 25 yards to play his next shot, a fairway wood over a line of trees. Fortunately, he was advised of the error before completing the hole and teeing off at the next hole, or he would have been disqualified for a serious breach of Rule 20-7. Presumably, he did not follow the Solheim Cup in 2013, where several players, caddies, team captains and officials all failed to get this Rule right, making the same mistake as J.B. Holmes. If you have any doubt about this you should read Rule 26-1, or view my video on taking relief from a lateral water hazard at this link. Thanks to those of you who have purchased my new book and written to me with such positive comments about the new format (with photos and diagrams). Please email me at barry at barry rhodes dot com if you would also like to purchase this new publication, '999 More Questions on the Rules of Golf 2016'. I just watched the Ernie Els six-putt debacle at this year's Masters. While I empathize with him (been there done close to that) and have no desire to heap additional abuse on him, should he have incurred an addition penalty for the last putt? I seem to remember being advised (many years ago when I played high school golf) never to putt the ball back toward yourself on a tap in because this was "standing in the line" of your putt, which was some kind of penalty. Am I remembering accurately? Has there been a rule change? Or was this overlooked in the Els case due to the shear shock of what happened? So, as Ernie Els was standing behind the hole from his short line of putt there was no breach of Rule 16-1e.